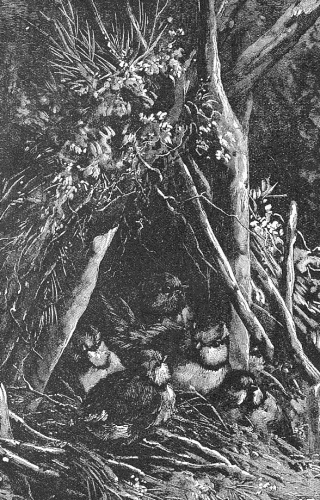 Lovely vintage image of a bird nest on the forest floor. This black and white bird drawing is copyright free and ready for downloading. Friends in Feathers and Fur, and Other Neighbors was a charming children’s book from 1885. James Johonnot (1823-1908) did not identify an illustrator but at least two of the drawings in this book appear to be by Harrison Weir (1824-1906).